Necessary resources for a 3 month study plan. currently I am looking for the best study resources in order to beat the GMAT. As my GPA is not high enough to apply for my desired master-program, I need to achieve a GMAT-score of 650. Today I bought the GMAT Official Guide 2018 Bundle and moreover joined the EMPOWERgmat. My goal is to beat the GMAT in 3 months from now on. Tomorrow I will make my first CAT in order to find my weak spots. I already know that my verbal skills aren't great. Hopefully I am able to improve myself in that area. 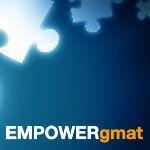 Are these resources (EMPOWERgmat & OG 2018 bundle) sufficient to study for the exam? I will post my results when I have done my first CAT. Like you, I started by asking the question, "Is X amount of time enough time" The answer everyone told me is that it depends. Not just on what score you want, but also, what score are currently at. Start by taking a practice test. You don't need to study for it, just know that you must finish each section or there are large penalties. Then choose a goal score. An improvement of 70-100 will require an intense 3 months (pushing it). An improvement of fewer points is very possible, an improvement of more points is not advised for 3 months. Also, don't waste time reading the official guide. Just learn the test and content through another source, such as empower, and then do the practice questions in the guide. You seem to understand the importance of taking that first practice CAT - since we need to assess your current skills, strengths and weaknesses. That initial result doesn't place a 'limit' on how much you might improve though. Our largest recorded score increase from a Client was 380 points in about 3 months. While that type of result is not typical, it shows that you could potentially improve more than what grahamtandrew assessed. The GMAT is remarkably good at giving Test Takers the score that they EARN, so it's important to think in those terms as you study (and on Test Day): how hard are you willing to work and what are you willing to learn/practice/master to EARN that higher score? The good news is that the GMAT is a consistent, predictable Exam, so you CAN train to score at a higher level. The bad news is that you will probably have to change the way that you 'see' (and respond to) the Exam - and that's something that can be tough for some people. The conlusion that I can draw from this result is to work on my endurance and concentration during the test. I lost my sharpness and concentration during the verbal part. This can be seen from the fact that I answered the last 7 questions wrong in the verbal section. Moreover, IR is a total disaster. Of course, the result is a huge disappointment for me. My goal is to score 650 three months from now on and therefore, I need to improve with 160 points over this time span. It encourages me, however, to work even harder. My schedule enables me, when it is needed, to study each day longer. To start, a 490 isn't that bad (the average score on the Official GMAT hovers around 540-550 most years). Many Test Takers are unhappy with their initial practice scores, but you really shouldn't be. That score is just a measure of your skills right now - and you've given yourself 3 months to study (which was a smart choice), so now it's time to get to work.